LCol Claire Bramma joined the CAF in 1998 and attended the Royal Military College where she earned a Bachelor of Civil Engineering in 2002. As a Royal Canadian Engineer (RCE) officer she has filled a variety of command, staff and operational appointments. In addition, she completed the UK Army Survey Course in 2006 (MSc in Defence Geographic Information) as well as the Joint Command and Staff Program in 2015 (Masters of Defence Studies). Her operational experience includes both expeditionary and domestic operations, completing two tours in Kabul Afghanistan as well as two disaster relief missions in Canada. She commanded 55 Support Squadron (5e Regiment du genie de Combat) from 2009-2011 and deployed to Haiti (Op HESTIA) following the 2010 Earthquake. Previously at the Mapping and Chartings Establishment (MCE) she fulfilled a variety of roles including Survey Troop Commander and Unit Operations Officer. 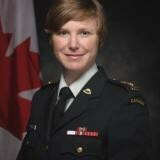 She deployed as Deputy Chief Geospatial Officer at ISAF HQ in 2012 and comes back to MCE following a posting as Directing Staff at Canadian Forces College Toronto. Check out the incredible speaker line-up to see who will be joining Lt Colonel Claire.